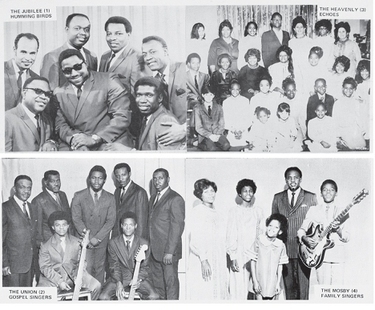 DESIGNER The story of gospel music in the 1960s and ’70s is strewn with small record labels. Most produced only a few discs, usually of one or two local artists and selling only a few hundred copies around their home areas. But a few were run on a larger scale. One was Designer, from Memphis, Tennessee, which between 1968 and 1978 produced between 400 and 500 singles and a few albums. Yet less than 30 years after the last issue, Designer has faded into the mist, and little is known of its story. The printed labels tells us it was run from at least two addresses in Park Avenue, Memphis – No 3373, then later No 3109 – by Style Wooten and Charles Bowen. Designer was, in effect, two labels in one. The main one was the “vanity” or “custom” label – available to anyone who could pay the cost of a recording session and having anything between 100 and 1000 45rpm singles pressed. But as well, Wooten and Bowen signed promising artists to contracts, carrying the costs, marketing the discs – and reaping the profits. Another who recorded as a paying customer was Melvin Mosley, who in 1978 took over from Jethroe Bledsoe as lead singer of the Spirit of Memphis quartet, a position he still holds. But five years earlier, he was a young soloist, looking for a way to boost his reputation. He went to Designer. “I recorded a gospel record in 1973, “The Day I Was Converted.” The flipside was “It is Real.” [Designer 7085] It did pretty good. I had a thousand pressed and I sold a thousand, so I was proud of that. I sold every one of them.” Wooten had several other “custom” labels, including Camaro, Pretty Girl (also the name of one of his music publishing companies, which claimed rights to fairly much anything the stable issued), Allendale, J’Ace and Styleway, which issued country, rock, and some blues and R&B. Designer appears to have been purely a gospel label. Most of its artists were African American quartets and small groups from Memphis and the Mid-South, although half a dozen choirs appear in the lists and artists from as far away as New Jersey, New York and Illinois had records issued. Some white artists were also recorded; at least two groups – The Gospel Melodies and The Happy Time Singers – had Designer issues. The dual nature of the label means its artists are of widely varying quality, ranging from semi-professional acts such as the Shaws, the Jubilee Hummingbirds, the Memphis Harmonizers and the Gospel Songbirds to family groups whose budgets and ambitions perhaps exceeded their musical abilities. Designer’s last issue appeared in 1978. The reason for the label’s closure is as obscure as the rest of its life-story, although rumour has it that Wooten and Bowen were pressured out by rival local labels and recording studios which didn’t like the competition. But the Designer legacy survives – a wonderful wide-angle snapshot of grassroots gospel through a fascinating decade of change.